Hey all! How do you guys stay organized with your projects? I discovered the Bullet Journal system about two years ago, and now I can't imagine life without my bujo! I use it to keep track of my daily to-do's, future appointments, projects - you name it. It's been especially helpful having a set place for my crochet notes, instead of random notebooks and loose pieces of paper. When I need to reference a past project for a pattern or hook size, I know where to go. 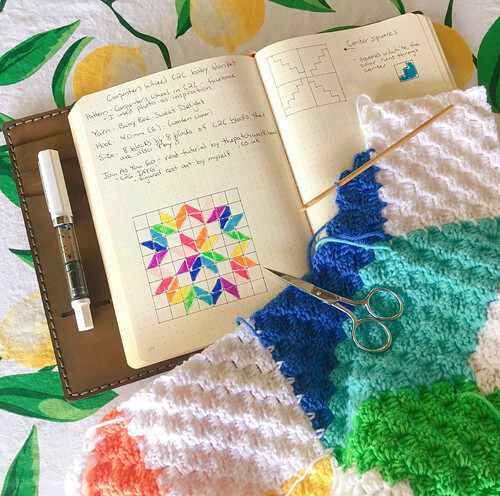 In the photo above, you can see my current crochet project, a corner to corner baby blanket, and my project notes so far. Since my bullet journal goes practically everywhere with me, I always have the blanket's diagram to follow. This is also the first time that I've used the join-as-you-go method with corner to corner, and I'm loving it! I'm already dreaming up future projects with it... But I can't get too ahead of myself! I'll be sharing more photos of this blanket soon! In the meantime, do you guys keep a bullet journal? If not, you should definitely look into it! !